Alaska has some very interesting laws about driving. Some may even seem outright odd to you. You should be aware of these before you start driving there. This way you can avoid getting any tickets. Although, several of these laws actually allow drivers a little bit more freedom regarding certain things such as marijuana or firearms. If you are twenty-one years of age or older in Alaska, you can drive with marijuana in your vehicle even if it is not for medical use. However, you may not drive under the influence of marijuana and you can not use it in public. In Alaska, you may not drive while using any sort of visual screen device. This means you can’t text, browse the web, or do anything that involves looking at your phone while you drive. However, you may talk on the phone while you drive. Even if you are talking on the phone with it in your hand and held to your head, it is perfectly legal. This is probably the strangest one on this list, but it is a law, nonetheless. A person can not ride in a trailer while it is being moved along a street. So, this means you can’t occupy any trailer, even if it is a house trailer, if it is not part of the vehicle being driven. Recreational vehicles are an exception to this because the live-in part of the vehicle is in the same part of the vehicle which drives. Flashing your headlights – You cannot use your high-beams within five hundred feet of an oncoming vehicle. This really means that flashing your headlights to let another driver know that their headlights are off at night or about police down the road could easily get you a ticket. Daytime headlight use – During certain periods of the year, namely the low-light winter months, most Alaskan roadways require that your headlights be on at all times while you are operating your vehicle. If you want to play it safe without having to look up the specific laws and regulations for each road that you will be traveling on, we recommend that you keep your headlights on at all times regardless of the time of year or day. Alaska is tied with a few other states with the lowest minimum driving age in the United States. In Alaska, a person only needs to be fourteen years of age to get their learner’s permit. The other states that allow someone to get their learner’s permit at fourteen are Arkansas, Iowa, North Dakota, and South Dakota with several other states allowing people ages fourteen and six months or fourteen and nine months to get their permits. There are definitely several interesting laws in Alaska regarding driving. It is one of the more lenient states with laws about driving with marijuana and firearms. This is likely because of how difficult travel can be in Alaska. No matter what the laws are in a place like Alaska, always remember to drive with caution. 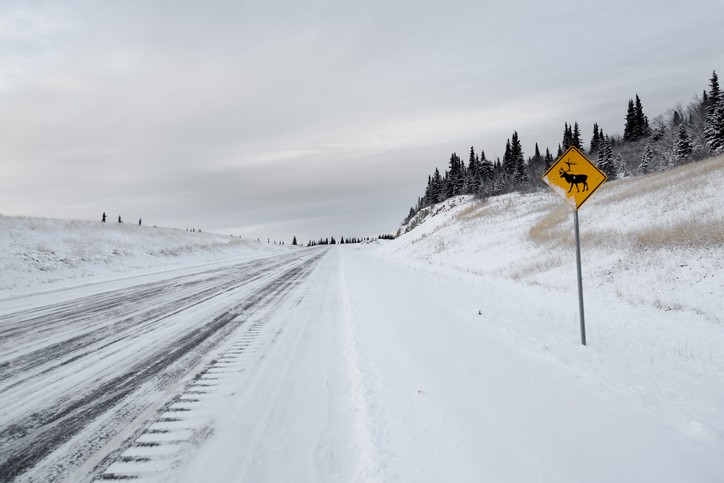 There can be very tough inclement weather conditions out on the road as well as wildlife crossing the roadways at various times of the year.